What Matters in Jane Austen by John Mullen – after hearing such wonderful things about this, I am so excited to finally have my hands on it. Keith Stewart is an ordinary man. However, one day he is called upon to undertake an extraordinary task. When his sister’s boat is wrecked in the Pacific, he becomes trustee for his little niece. In order to save her from destitution he has to embark on a 2,000 mile voyage in a small yacht in inhospitable waters. His adventures and the colourful characters he meets on his journey make this book a marvellous tale of courage and friendship. Life After Life by Kate Atkinson – Atkinson’s latest. And, for good measure, two D.E. 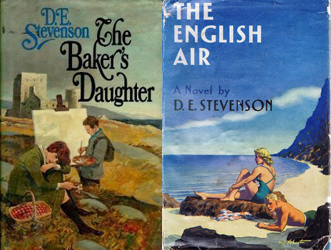 Stevenson novels via inter-library loan: The Baker’s Daughter and The English Air (which I’ve already read and loved). I know! I’ve only started using ILL in the last year but it has been such a wonderful tool. I hadn’t heard about this book by John Mullen. I read very little non-fiction but as I respect his opinion I will make an exception and look out for this book. Thank you. Everything I’ve heard about What Matters in Jane Austen? has been positive. It sounds like a really fun read and goodness knows I never tire of books about Austen! The synopsis of your Shute novel sounds wonderful and Pied Piper would make a great follow-up read if you enjoy it, Claire. And I am supremely envious that you have that Mullen book at home. I really enjoy his appearances on a couple of book podcasts that I listen to and think how wonderful it must be for his students to have him as an English professor. Doesn’t the Shute sound fun? Pied Piper is still on my TBR list so hopefully I’ll get to it soon. And I can’t wait to start on the Mullen! 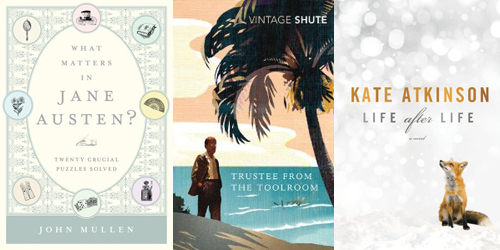 I didn’t know that Nevil Shute’s novels are being re-printed. Except for A Town Like Alice, they are very hard to find around here. Trustee from the Toolroom is an interesting one. I’m so far down on the library list for the Atkinson book. Yep, Vintage has been reissuing them for several years, some with plain red covers, other with lovely illustrated ones. When I first started reading Shute in high school it was very difficult to find anything other than A Town Like Alice and On the Beach. Thankfully, that’s not a problem anymore! I need to read Life After Life! I have heard so many good things about it! I am really excited to get into it! So far, Atkinson has never disappointed. I’ve heard good things about Atkinson’s books but have yet to pick one up. Enjoy your loot. They are all great, Linda! I hope you try them one day. I’ve never read Nevil Shute before but after reading that synopsis, I’m kinda intrigued. Shute is great. I think you would like him, though I’d recommend starting with A Town Like Alice (which is fantastic). Trustee From Toolroom. 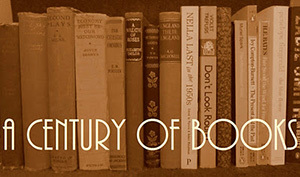 Ooo, I read it a million years ago, and it was wonderful. HIs best kind of story where an ordinary guy is called upon to be heroic in unexpected ways (such as No Highway and The Pied Piper). But I know my copy went out in a purge. Now I regret it of course. I’ll bet it’s hard to find. The Baker’s Daughter (aka Miss Bun the Baker’s Daughter) Nice set up and atmosphere on the cover. The artist DOES know what’s in the book. Sadly, they ignored the fact that Miss Bun is a young, practical Scottish housekeeper in 1938, not a dreamy tweedie university student from 1975. The English Air: I have NEVER seen this jacket art below (and I’m obsessive about collecting images of DES cover art) and it is absolutely perfect. What edition is it from? Is it original, i.e., 1940? Not hard to find anymore! Vintage has put more than 20 of his books back in print. Re: cover art. I have no idea which edition the jacket art for The English Air comes from. My library copy has a DIY dust jacket using the image but the book itself is a 1960s reprint. Aren’t they lovely? I especially love the cover on Trustee From the Toolroom. Loved the Kate Atkinson! I was lucky enough to win a copy of the John Mullen last month and really looking forward to reading it. Enjoy your loot! It has been ages since I last read anything by Atkinson so I can’t wait to crack this open! And here’s hoping we both enjoy What Matters in Jane Austen?. I’ve heard Life after Life is a great story – enjoy the read! I knew they were publishing the third book but I hadn’t realised it was coming so soon – excellent news! I didn’t like the first Miss Buncle book at all but I’ve been told by those in the know that I’ll probably like the third and fourth ones (The Two Mrs Abbotts and The Four Graces). All your books have such great covers. Life after Life sounds like it’ll be a really great read. I hope you enjoy all of your books! They are pretty this week, aren’t they? I hope the content is just as good (and I’m pretty sure it will be). Wonderful books. The Trustee from the Toolroom is a great read and a favorite of mine and of my children. And the DES books are quite interesting as well. I’m currently reading What Matters in Jane Austen myself but have never heard of the Atkinson. So I’ll have to look. As detailed in email, I tried Stevenson and was very pleased. Read CROOKED ADAM, which is a during WWII spy sort of novel. Now I want to try more.